South American flights to Brazil, Argentina, and Chile only. With that, Let's Eat 2019! I took ORD-PVG yesterday and selected shrimps and scallops as the main course. It had two pieces of shrimps and two pieces of scallops, some nice and vegetable. It did not fill up half of the bowl. I wish that the serving size should be doubled unless United wants to put everyone in Polaris cabin on diet. Here is the picture taken before I took any bite! I have given up eating the meals on United. Mostly, I have been flying out of SFO (PEK and SIN) and IAH (AMS), so i hit the polaris lounge and have my meal there. Then just do cheese plate, snacks and cliff bars on the plane. Flew back from IAH to LHR on UA880 last night. Was surprised, and rather disappointed to see the entire menu comprised of Asian fusion dishes. Not a single dish remotely european. Ended up ordering the Beef Rib with five spices sauce, wasabi grits and bok chok. Not the most enjoyable experience. The menu would have been far better for a pacific flight than an atlantic one. 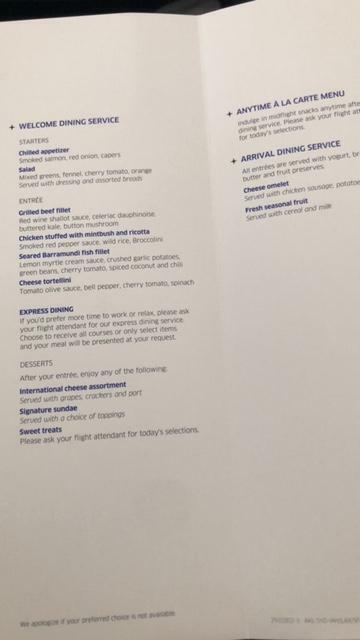 In fact, found the menu in the 2018 thread offered for an SFO -TPE flight. Here is the Jan 2019 menu for all flights out of SYD & AKL. The new plating starts 01FEB, FAs were not impressed when I discussed with them. 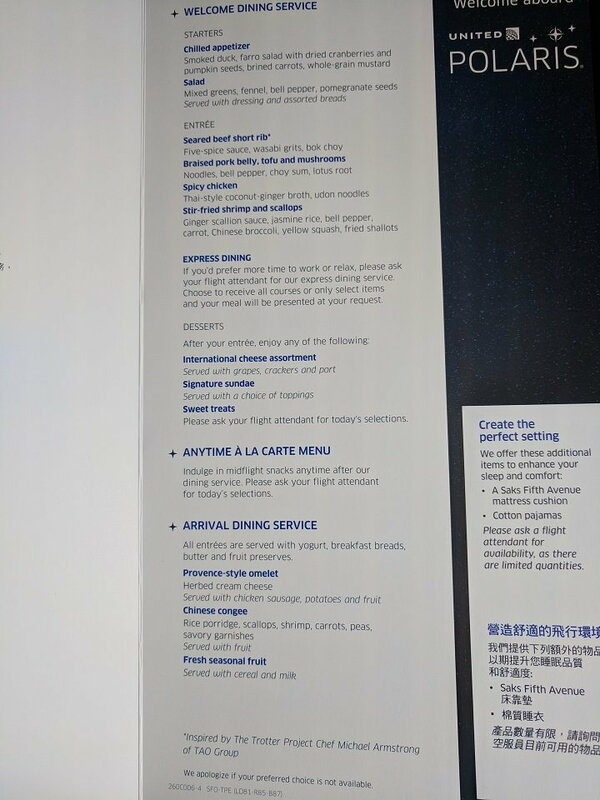 I too had this menu on ua880 in early december. I chose the shrimp option which I found too hot for my palate. For my sins I will be on ithe same flght again at the end of this month and really hope this menu does not reappear on flghts to UK. Was the pilot doing a barrel roll when the photo was taken? geckoflyer, 1984SW, munster182 and 4 others like this. It looks like UA is cutting its inflight meal budget to meet Wall Street earning expectation rather than customer expectation. 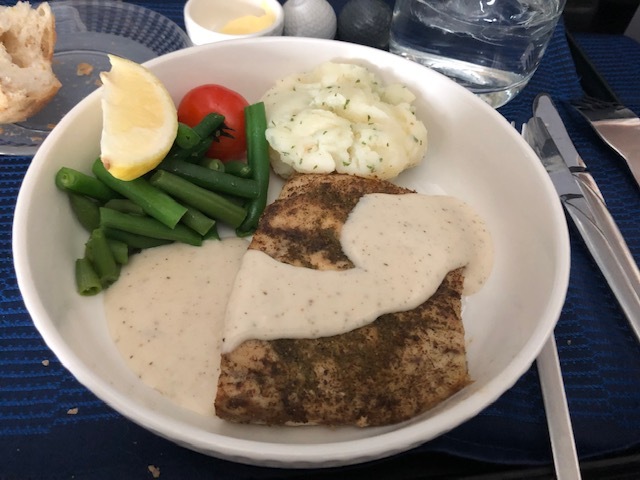 It is not just UA, SQ has also cut back and I noticed few shrimps and scallops on the SQ plate as well. SQ at least add more vegetable and provide better presentation to make it visually appealing. Had soy-glazed chicken on NRT-EWR this evening. T was quite solid. As for portions being smaller, I don’t mind - I have always felt the portions were too large anyways. Lentil chilli with roasted garlic polenta & sauteed spinach. Settled for wine, bread roll and an ice cream. Sadly, the spicy Thai noodles were gone from my flight to Beijing. Replaced with a lemongrass ginger chicken with pot stickers. I ordered it hoping it was a close facsimile thereof. NOPE. My goodness was it horrible. I love flavor and spice, but all you could taste was very overpowering ginger and equally over-fragrant lemongrass. (I like both ginger and lemongrass, but this was unbearable). I don’t send back food—airplane or restaurant. But asked for some paper napkins and quietly wiped the sauce off of my dumplings and chicken. That being said, once I did, I rather enjoyed the dumplings (they called them pot stickers—being pedantic, they were not pot stickers, they never saw a hot pan and were not crispy or ‘burnt’ at all, they were more just like jiaozi). The chicken was “meh” at best. I later overheard the F/As talking about the “new fish dish”. I almost ordered it, and after their comments praising it, I wish it would have. Salad was incredibly small and wilted. Seared tuna appetizer was good, and the sundae and dessert bites were definitely the highlights. What was the "new fish dish"? I’m sorry, I meant to grab the menu as I deplaned, but forgot it. One whitefish or another, I think with a miso glaze—yeah, pretty informative, huh?!?! I know it was not salmon or tuna, and I do know it was served with fried noodles. With the brief glance I had of it as an FA walked by, it did look rather tempting. Had the Chicken satay on a recent HKG-ORD flight. I thought it was quite good. All times are GMT -6. The time now is 1:24 am.